*[[John|John Bogovic]] recently presented '''"Topology-Preserving STAPLE"''' at MMBIA 2010 in San Francisco. Shuo Han presenting the poster "A resolution measurement algorithm for MRI". The IACL team finishes second at the CHAOS Challenge at ISBI 2019. Yihao Liu presented "Projection Artifact Suppression for Inner Retina in OCT Angiography". Shuo Han presented "A resolution measurement algorithm for MRI". IACL members present papers at the SPIE Medical Imaging (SPIE-MI 2019) meeting in San Diego, CA, February 15 - 20, 2019. Shuo Han presented "Cerebellum parcellation with convolutional neural networks". Lianrui Zuo presented "Automatic Quality Control Using Hierarchical Shape Analysis". Jacob Reinhold presented "Evaluating the impact of intensity normalization on MR Image Synthesis". 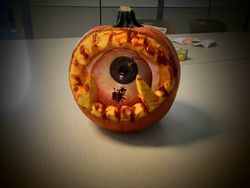 IACL wins the 2018 ECE Pumpkin Carving Contest!! IACL members win the 2018 ECE Pumpkin Carving Contest!! 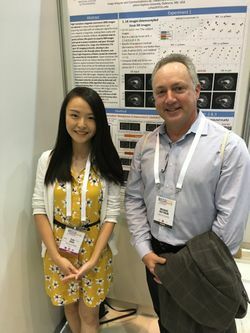 Can Zhao presenting her work titled "A Deep Learning based Anti-aliasing Self Super-resolution Algorithm for Magnetic Resonance Imaging" to Dr. Michael Guttman at MICCAI 2018. Dr. Guttman was the first graduate student to ever work in IACL. IACL members present papers at the 21st International Conference on Medical Image Computing and Computer Assisted Intervention (MICCAI 2018), Granada, Spain, September 16 - 20, 2018. Dr. A.D. Gomez presented "Quantifying Tensor Field Similarity With Global Distributions and Optimal Transport". Can Zhao presented "A Deep Learning based Anti-aliasing Self Super-resolution Algorithm for Magnetic Resonance Imaging". We also had presentations at several MICCAI workshops. Dr. A.D. Gomez presented "Quantitative validation of MRI-based motion estimation for brain impact biomechanics" at Computational Biomechanics for Medicine (CBM XIII). At Simulation and Synthesis in Medical Imaging (SASHIMI 2018), Blake Dewey presented "Deep Harmonization of Inconsistent MR Data for Consistent Volume Segmentation" and Yuta Hiasa presented "Crossmodality image synthesis from unpaired data using CycleGAN: Effects of gradient consistency loss and training data size". Dr. J.L. Prince presented "Shortcomings of Ventricle Segmentation Using Deep Convolutional Networks" at the Deep Learning Fails Workshop and also "Unpaired Brain MR-to-CT Synthesis using a Structure-Constrained CycleGAN" at the 4th Workshop on Deep Learning in Medical Image Analysis (DLMIA 2018). In collaboration with Univ. of Pennsylvania, Dr. Min Chen presented "2D Modeling and Correction of Fan-beam Scan Geometry in OCT" at 5th Workshop on Ophthalmic Medical Image Analysis (MW-OMIA5). Dr. Chen also won the Best Poster prize at MW-OMIA5. IACL members present papers at the International Symposium on Biomedical Imaging (ISBI 2018) meeting in Washington, DC, April 4 - 7, 2018. 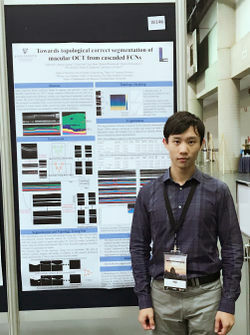 Can Zhao presented "Self Super-Resolution for Magnetic Resonance Images Using Deep Networks". Yihao Liu presented "Multi-Layer Fast Level Set Segmentation for Macular OCT". 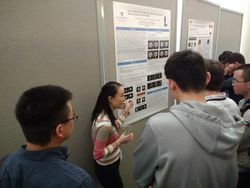 Can Zhao presenting her poster titled "Self Super-Resolution for Magnetic Resonance Images Using Deep Networks". Yihao Liu presenting his poster titled "Multi-Layer Fast Level Set Segmentation for Macular OCT". IACL members present papers at the SPIE Medical Imaging (SPIE-MI 2018) meeting in Houston, TX, February 10 - 15, 2018. Lianrui Zuo presented "Automatic outlier detection using hidden Markov model for cerebellar lobule segmentation". Muhan Shao presented "Multi-atlas segmentation of the hydrocephalus brain using an adaptive ventricles atlas". Jeffrey Glaister presented "Deformable model reconstruction of the subarachnoid space". Xiaokai Wang presented "A novel filtering approach for 3D harmonic phase analysis of tagged MRI"
Other accepted papers at SPIE-MI 2018 coming from collaborations with IACL. With Sachin Goyal from IIT Bombay presented "Improving Self Super Resolution in Magnetic Resonance Images". With Aniket Tolpadi from Rice University "Inverse biomechanical modeling via machine learning and synthetic training data". With Sureerat Reaungamornrat from Mahidol University "Inter-scanner Variation Independent Descriptors for Constrained Diffeomorphic Demons Registration of Retinal OCT". Muhan Shao presenting her talk titled "Multi-atlas segmentation of the hydrocephalus brain using an adaptive ventricles atlas". Jeffrey Glaister presenting his poster "Deformable model reconstruction of the subarachnoid space". Aniket Tolpadi presenting his talk "Inverse biomechanical modeling via machine learning and synthetic training data". 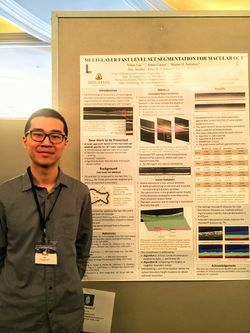 Yufan He with his awarding winning poster at the OMIA Workshop, held in conjunction with MICCAI 2017. Presenting during Workshops at the 20th International Conference on Medical Image Computing and Computer Assisted Intervention (MICCAI 2017), Quebec, Canada, September 10 - 14, 2017. Can Zhao presented "Whole brain segmentation and labeling from CT using synthetic MR images" (doi) and "A super-voxel based random forest synthesis framework for bidirectional MR/CT synthesis". Dr. Jerry L. Prince presented "Group Patterns of Acceleration-Induced Brain Deformation in Vivo". Dr. Jerry L. Prince presnted a keynote at Brain Lesion Workshop entitled "Dice overlap measures for multiple objects: Application to lesion segmentation". Dr. Lang and Dr. Bilgel receive their PhDs from Electrical & Computer Engineering and Biomedical Engineering, respectively. Lab alumni Yeyi Yun graduates with a BA, triple majoring in Electrical & Computer Engineering, Economics, and Mathematics. Dr. Prince collecting his award for promoting diversity. Dr. Jerry L. Prince wins the 2017 Diversity Recognition Award from the Johns Hopkins Diversity Leadership Council (DLC). The paper "Longitudinal multiple sclerosis lesion segmentation data resource", (doi) is published. Johns Hopkins Magazine features an article titled "The CEO who learned to ask" about IACL colaborator David Narrow, the CEO of Sonavex. The 2017 ENIGMA Cerebellum Challenge and Workshop website launches. 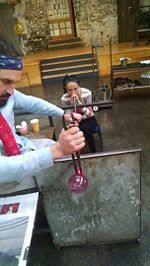 The Challenge and Workshop is a collaboration between IACL, the MASI Lab at Vanderbilt, and the IGC Lab at the Univ. of Southern California. The one day Challenge and Workshop is a satellite event of MICCAI 2017, which will be held in Quebec, Canada. Dr. Prince after meeting with students from the "Discovery to Market" class from The Johns Hopkins Carey Business School. Dr. Jerry L. Prince is working with students from Dr. Nayoung Louie's "Discovery to Market" class from The Johns Hopkins Carey Business School. Dr. Prince presenting the poster "Improving graph-based OCT segmentation for severe pathology in Retinitis Pigmentosa patients" at SPIE-MI 2017. IACL members present papers at the SPIE Medical Imaging (SPIE-MI 2017) meeting in Orlando, FL, February 11 - 16 2017. Dr. Jerry L. Prince presents "Test-suite for image-based motion estimation of the brain and tongue", "Longitudinal Analysis of Mouse OCT Volumes", "Improving graph-based OCT segmentation for severe pathology in Retinitis Pigmentosa patients", and "Collaborative SDOCT Segmentation and Analysis Software". Blake E. Dewey presents "Efficient Multi-Atlas Registration using an Intermediate Template Image". Jeffrey Glaister presents "Automatic falx cerebri and tentorium cerebelli segmentation from Magnetic Resonance Images". Junghoon Lee presents "Multi-atlas-based CT synthesis from conventional MRI with patch-based refinement for MRI-based radiotherapy planning". Other accepted papers at SPIE-MI 2017 coming from collaborations with IACL. With colleagues at MGH "A four-dimensional motion field atlas of the tongue from tagged and cine magnetic resonance imaging". The papers "Random forest regression for magnetic resonance image synthesis", (doi) (PubMed),"Longitudinal Multiple Sclerosis Lesion Segmentation: Resource and Challenge", (doi) (PubMed), and "Cross contrast multi-channel image registration using image synthesis for MR brain images", (doi) (PubMed) are published. The paper "MIND Demons: Symmetric Diffeomorphic Deformable Registration of MR and CT for Image-Guided Spine Surgery", IEEE Trans. on Medical Imaging, 35(11):2413-2424, 2016 (doi) (PubMed) is published. Dr. A. David Gomez collecting the best paper prize at the Computational Biomechanics for Medicine XI Workshop at the 19th International Conference on Medical Image Computing and Computer Assisted Intervention (MICCAI 2016), Athens, Greece, October 17 - 21, 2016. 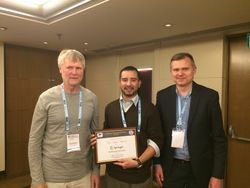 Dr. A. David Gomez wins the best paper prize at the Computational Biomechanics for Medicine XI Workshop at the 19th International Conference on Medical Image Computing and Computer Assisted Intervention (MICCAI 2016), Athens, Greece, October 17 - 21, 2016. IACL members present papers at the 19th International Conference on Medical Image Computing and Computer Assisted Intervention (MICCAI 2016), Athens, Greece, October 17 - 21, 2016. Dr. Amod Jog presented "Self Super-resolution for Magnetic Resonance Images", as part of the main conference (doi) and "Patch Based Synthesis of Whole Head MR Images: Application to EPI Distortion Correction", at the SASHIMI: Simulation and Synthesis in Medical Imaging Workshop. Dr. A. David Gomez presented "Motion Estimation with Finite-Element Biomechanical Models and Tracking Constraints from Tagged MRI", at the Computational Biomechanics for Medicine XI Workshop and "Incompressible Phase Registration for Motion Estimation from Tagged Magnetic Resonance Images", Reconstruction and Analysis of Moving Body Organs‎ (RAMBO 2016) Workshop. Dr. Jerry L. Prince presented the keynote lecture "Patches and pulse sequences for MR image intensity normalization", at the 2nd International Workshop on Patch-based Techniques in Medical Imaging (Patch-MI). The papers "Temporal filtering of longitudinal brain magnetic resonance images for consistent segmentation", NeuroImage: Clinical, 11:264-275, 2016 (doi) and "Consistent Cortical Reconstruction and Multi-atlas Brain Segmentation", NeuroImage, 138:197-210, 2016 (doi) are published. The paper "Estimation of fiber orientations using neighborhood information", Medical Image Analysis, 32:243-256, 2016 (doi) is published. The paper "A multivariate nonlinear mixed effects model for longitudinal image analysis: Application to amyloid imaging", NeuroImage, 134:658-670, 2016 (doi) is published. Drs. Yang, Xing, and Jog celebrate receiving their PhDs with Jerry L. Prince. Drs. Zhen Yang, Fangxu Xing, and Amod Jog celebrate their hooding ceremony as part of receiving their PhDs with Jerry L. Prince. Paper submission for the MICCAI Workshop SASHIMI: Simulation and Synthesis in Medical Imaging is open. The workshop is focussed on the development of synthetic data with known ground truth to help develop, evaluate, and validate image analysis and reconstruction algorithms. 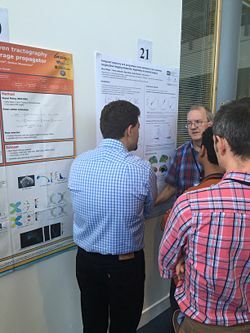 Andrew Lang presenting his poster "Intensity inhomogeneity correction of macular OCT using N3 and retinal flatspace" at the 13th IEEE International Symposium on Biomedical Imaging (ISBI 2016), Prague, Czech Republic, April 13 - 16, 2016. 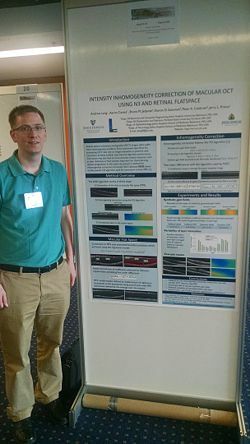 Andrew Lang presents his paper titled "Intensity inhomogeneity correction of macular OCT using N3 and retinal flatspace" at the 13th IEEE International Symposium on Biomedical Imaging (ISBI 2016), Prague, Czech Republic, April 13 - 16, 2016. 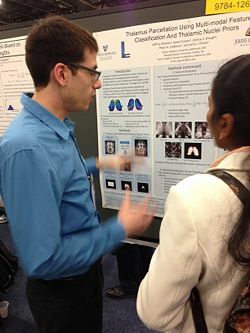 Jeff Glaister presenting his poster "Thalamus parcellation using multi-modal feature classification and thalamic nuclei priors" at SPIE Medical Imaging (SPIE-MI 2016) in San Diego. Andrew Lang is short-listed for the Robert F. Wagner All Conference Best Student Paper for his work titled "Combined registration and motion correction of longitudinal retinal OCT data" at SPIE Medical Imaging (SPIE-MI 2016). IACL members present papers at the SPIE Medical Imaging (SPIE-MI 2016) meeting in San Diego, CA, February 27 - March 3, 2016. Andrew Lang presented "Combined registration and motion correction of longitudinal retinal OCT data". Ke Li presented "Quality Assurance using Outlier Detection on an Automatic Segmentation Method for the Cerebellar Peduncles". Mazy Abulnaga presented "A toolbox to visually explore cerebellar sub-structure shape changes in cerebellar ataxia". Zhen Yang presented "Landmark Based Shape Analysis for Cerebellar Ataxia Classification and Structural Change Pattern Visualization". Can Zhao presented "Effects of Spatial Resolution on Image Registration". Jeff Glaister presented "Thalamus parcellation using multi-modal feature classification and thalamic nuclei priors". Bhavna Antony presented "Voxel Based Morphometry in Optical Coherence Tomography: Validation & Core Findings" and "Simultaneous Segmentation of Retinal Surfaces and Microcystic Macular Edema in SDOCT Volumes". Lotta M. Ellingsen presented "Segmentation and labeling of the ventricular system in normal pressure hydrocephalus using patch-based tissue classification and multi-atlas labeling"
Other accepted papers at SPIE-MI 2016 coming from collaborations with IACL. With colleagues at Hopkins "Segmentation of Thalamus from MR images via Task-Driven Dictionary Learning". With colleagues at Vanderbilt "Combining Multi-atlas Segmentation with Brain Surface Estimation" and "Improving cerebellar segmentation with statistical fusion". Jerry L. Prince delivers a memorial for Dr. Lee Rosen at SPIE 2016. Jerry L. Prince delivers a memorial for Dr. Lee Rosen at SPIE 2016. Dr. Lee Allen Rosen passed away in October 2015. 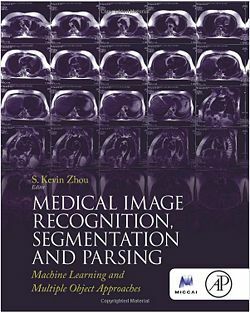 Medical Image Recognition, Segmentation and Parsing edited by S. Kevin Zhou is published by Elsevier. Medical Image Recognition, Segmentation and Parsing edited by S. Kevin Zhou is published by Elsevier. It features Chapter 12: An Overview of the Multi-Object Geometric Deformable Model Approach in Biomedical Imaging by Aaron Carass and Jerry L. Prince. WASHINGTON, D.C.— The American Institute for Medical and Biological Engineering (AIMBE) has announced the pending induction of Jerry L. Prince, Ph.D., William B. Kouwenhoven Professor, Electrical and Computer Engineering/Whiting School of Engineering, Johns Hopkins University, to its College of Fellows. Dr. Prince was nominated, reviewed, and elected by peers and members of the College of Fellows for outstanding contributions to biomedical imaging and image analysis. A formal induction ceremony will be held during AIMBE’s 25th Annual Meeting at the National Academy of Sciences Great Hall in Washington, DC on April 4, 2016. Dr. Prince will be inducted along with 160 colleagues who make up the AIMBE College of Fellows Class of 2016. 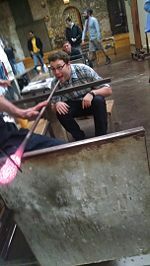 Lab photo from the glass ornament blowing at Corradetti Glass Studio. 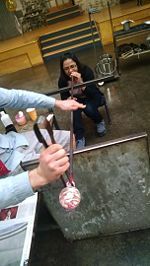 The lab celebrates the Holiday Season by blowing some glass ornaments. Lab photo saying goodbye to Drs. Xing and Yang. Fangxu Xing defends his thesis titled "Three Dimensional Tissue Motion Analysis from Tagged Magnetic Resonance Imaging". Dr. Xing will be joining Massachusetts General Hospital in Boston, Massachusetts, starting December 15th. Zhen Yang defends her thesis titled "Cerebellar Structure Segmentation and Shape Analysis with Application to Cerebellar Ataxia". Dr. Yang will be joining Google in Menlo Park, California, starting November 1st. Aaron Carass presents "Longitudinal Patch-Based Segmentation of Multiple Sclerosis White Matter Lesions" at the Machine Learning in Medical Imaging (MLMI 2015) workshop in Munich, Germany. Jerry L. Prince presenting a poster at IPMI 2015. Jerry Prince presented "Temporal trajectory and progression score estimation from voxelwise longitudinal imaging measures: Application to amyloid imaging" at IPMI 2015. An article describing the EchoSure Project developed by Sonavex (appears in the JHU Engineering Magazine). Andrew Lang presenting a poster at ARVO 2015. 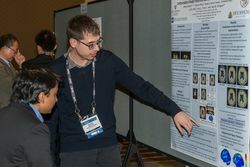 Andrew Lang presented his poster "Automated segmentation of macular SD-OCT scans of retinitis pigmentosa patients shows regional patterns of foveal inner retinal thickening that correlate with visual function" at ARVO 2015 in Denver, Colorado. Jeff Glaister presenting a poster at ISBI 2015. Jeff Glaister presented "Probabilistic Fiber Tracking using a Modified Lasso Bootstrap Method" at ISBI 2015 in Brooklyn, New York. The Longitudinal Multiple Sclerosis Lesion Segmentation Challenge took place as part of ISBI with ten teams presenting their work on the Challenge day. The paper S. Roy, W.-T. Wang, A. Carass, J.L. Prince, J.A. Butman, and D.L. Pham, "PET Attenuation Correction Using Synthetic CT from Ultrashort Echo-Time MR Imaging", Jrnl. of Nuclear Medicine, 55:1-7, 2014 (doi) wins the Alavi-Mandell Publication Award from the Society of Nuclear Medicine and Molecular Imaging (SNMMI). The Longitudinal Multiple Sclerosis Lesion Segmentation Challenge takes place on April 16th, 2015. Registration for the Longitudinal Multiple Sclerosis Lesion Segmentation Challenge closes. The Challenge is a collaboration between the IACL Lab, the Henry M. Jackson Foundation, the Max Plank Institute, and the University of Iceland, and takes place as part of the 12th IEEE International Symposium on Biomedical Imaging (ISBI 2015) in New York on April 16th, 2015. 34 Teams registered for the Challenge coming from 15 different countries, representing 27 different institutions/universities. 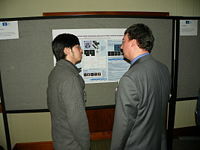 Alessandro Asoni's prize winning poster at SPIE-MI. Andrew Lang presenting his paper "Longitudinal graph-based segmentation of macular OCT using fundus alignment". Gunnar Sigurdsson presenting his paper "Interpretable exemplar-based shape classification using constrained sparse linear models". Fangxu Xing presenting his paper "Relating speech production to tongue muscle compressions using tagged and high-resolution magnetic resonance imaging". Emily Swingle presenting her paper "Segmentation of microcystic macular edema in Cirrus OCT scans with an exploratory longitudinal study". Amod Jog presenting his paper "Multi-output decision trees for lesion segmentation in multiple sclerosis". Alessandro Asoni wins a poster prize at SPIE-MI 2015 in Orlando, Florida. IACL members presented papers for the Proceedings of SPIE Medical Imaging (SPIE-MI 2015), Orlando, FL, February 21-26, 2015. Alessandro Asoni presented "B-Mode ultrasound pose recovery via surgical fiducial segmentation and tracking". Andrew Lang presented "Longitudinal graph-based segmentation of macular OCT using fundus alignment". Gunnar Sigurdsson presented "Interpretable exemplar-based shape classification using constrained sparse linear models". Emily Swingle presented "Segmentation of microcystic macular edema in Cirrus OCT scans with an exploratory longitudinal study". 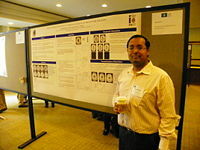 Amod Jog presented "Multi-output decision trees for lesion segmentation in multiple sclerosis". Fangxu Xing presented "Relating speech production to tongue muscle compressions using tagged and high-resolution magnetic resonance imaging". Min Chen presented "Using image synthesis for multi-channel registration of different image modalities". Chuyang Ye successfully defends his PhD thesis titled "Fiber Tracking and Fiber Tract Segmentation Using Diffusion Tensor Imaging". Min Chen successfully defends his PhD thesis titled "Deformable Image Registration in the Analysis of Multiple Sclerosis". Details are made available about the 2015 Longitudinal Multiple Sclerosis Lesion Segmentation Challenge which will be held as part of the International Symposium on Biomedical Imaging. The challenge will involve teams applying their automatic lesion segmentation algorithms to MR neuroimaging data acquired at multiple time points from patients with multiple sclerosis (MS). Jerry L. Prince will be speaking at the University of Utah on Friday, November 14, 2014. The topic will be "Medical Image Synthesis Methods and Applications". 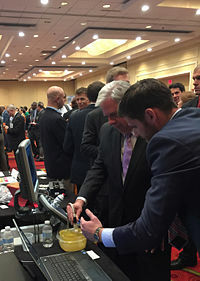 Despite having no prior ultrasound experience, Maryland Governor Larry Hogan uses the EchoFind software guidance to successfully navigate the EchoMark in a test phantom. The EchoSure team was invited as a featured presenter and exhibitor at TEDCO's 4th annual Maryland Entrepreneur Expo (http://expo.tedco.md/). Conference participants -- including newly elected Maryland Gov. Larry Hogan -- had the opportunity to try the live EchoFind software demo themselves. Even first-time ultrasound users were able to accurately navigate the test phantom and the team received tremendous positive feedback on their successful demonstration. Jonghye Woo on his last day in the IACL Lab with the labs director Jerry L. Prince. The IACL Lab in association with collaborators at the Henry M. Jackson Foundation, the Max Plank Institute, and the University of Iceland will be organizing the Longitudinal Multiple Sclerosis Lesion Segmentation Challenge as part of the 12th IEEE International Symposium on Biomedical Imaging (ISBI 2015), New York, NY, April 16 - 19, 2015. Jonghye Woo has his last day in the IACL Lab. IACL receives a 2014 NIH Grant for Segmentation and Registration of Macular SD-OCT with applications to Multiple Sclerosis. 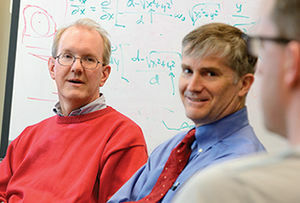 Jerry L. Prince and Peter A. Calabresi from an article in JHU Engineering. Amod Jog at ISBI 2014 in Beijing. Amod Jog presents two talks at the 11th IEEE International Symposium on Biomedical Imaging (ISBI 2014), Beijing, China, April 28 - May 2, 2014. Jerry L. Prince's book Medical Imaging Signals and Systems 2/E is released. The video and presentation from Fangxu Xing's 2013 MICCAI talk, titled "3D Tongue Motion from Tagged and Cine MR Images", is now available. IACL members presented papers for the Proceedings of SPIE Medical Imaging (SPIE-MI 2014), San Diego, CA, February 15-20, 2014. Andrew Lang presented "An adaptive grid for graph-based segmentation in macular cube OCT". Gunnar Sigurdsson presented "Smoothing fields of weighted collections with applications to diffusion MRI processing". Emily Swingle presented "Microcystic macular edema detection in retina OCT images". 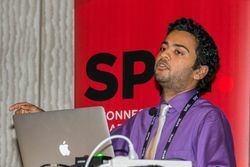 Snehashis Roy presented "MR to CT registration of brains using image synthesis" and "Example based lesion segmentation". Fangxu Xing presents "3D Tongue Motion from Tagged and Cine MR Images" at MICCAI 2013. (doi) The video and presentation of his talk are available here. John Bogovic presented his paper "Automated Segmentation of the Cerebellar Lobules Using Boundary Specific Classification and Evolution" at the 23rd International Conference on Information Processing in Medical Imaging (IPMI). 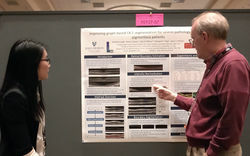 Chuyang Ye discussing his poster at ISBI 2013. Junghoon Lee presenting his paper at ISBI 2013. Joshua Stough at ISBI 2013. Min Chen discussing his poster at ISBI 2013. Snehashis Roy waiting to discuss his poster at ISBI 2013. IACL members presented papers at the Tenth IEEE International Symposium on Biomedical Imaging (ISBI 2013), San Francisco, CA, April 7 - 11, 2013. Chuyang Ye presented "Segmentation of the Complete Superior Cerebellar Peduncles using a Multi-object Geometric Deformable Model". Snehashis Roy presented "Patch Based Intensity Normalization of Brain MR Images" and "Longitudinal Intensity Normalization in the presence of Multiple Sclerosis Lesions". 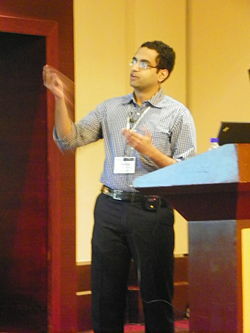 Amod Jog presented "Magnetic Resonance Image Synthesis through Patch Regression". Zhen Yang presented "Covariance shrinking in active shape models with application to gyral labeling of the cerebral cortex". Fangxu Xing presented "MRI Analysis of 3D normal and Post-glossectomy Tongue Motion in Speech". IACL members presented papers for the Proceedings of SPIE Medical Imaging (SPIE-MI 2013), Orlando, FL, February 9-14, 2013. 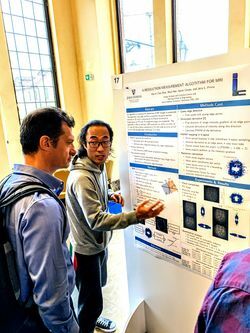 Chuyang Ye presented "Parcellation of the thalamus using diffusion tensor images and a multi-object geometric deformable mode". Zhen Yang presented "Automatic cell segmentation in fluorescence images of confluent cell monolayers using multi-object geometric deformable model". Min Chen presented "Voxel-wise displacement as independent features in classification of multiple sclerosis"
Amod Jog presented "Pulse sequence based multi-acquisition MR intensity normalization". Andrew Lang presented "Segmentation of retinal OCT images using a random forest classifier". Murat Bilgel presented "Automated anatomical labeling of the cerebral arteries using belief propagation". Nathanael Kuo presented "An intraoperative dynamic dosimetry guidance system for prostate brachytherapy". Jerry L. Prince presented Snehashis Roy's paper "Longitudinal intensity normalization of magnetic resonance images using patches". Jerry Prince was honored as a "Fellow of the MICCAI Society", which he received at the MICCAI Conference in Toronto, Canada. Snehashis Roy wins the best poster award at the 22nd Conference on Information Processing in Medical Imaging (IPMI 2011), Monastery Irsee, Germany, July 3-8, 2011. 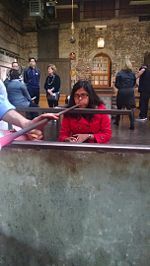 Harsh Agarwal after being hooded by Jerry L. Prince. 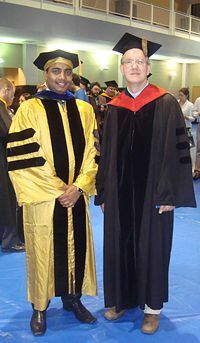 Harsh Agarwal earned his Ph.D. and is hooded by Jerry L. Prince. Yuanming Suo wins the Northern Digital Inc. Excellence Awards for his work on Semiautomatic segmentation of speech articulators using MRI. 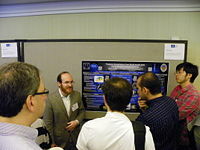 At the Eighth IEEE International Symposium on Biomedical Imaging (ISBI 2011), Chicago, IL, March 30 - April 2, 2011. Min Chen presented the talk Topology Preserving Automatic Segmentation of the Spinal Cord in Magnetic Resonance Images. Navid Shiee presented the poster Fiber tractography and tract segmentation in multiple sclerosis lesions. Snehashis Roy presented the poster Compressed Sensing Based Intensity Non-Uniformity Correction. 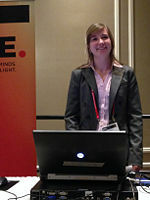 At the Proceedings of SPIE Medical Imaging (SPIE-MI 2011), Orlando, FL, February 12-17, 2011. Min Chen presented the talk Distance Transforms in Multi Channel MR Image Registration. Jerry L. Prince presented the talk Intensity Inhomogeneity Correction of Magnetic Resonance Images using Patches. Min Chen recently attended the NAMIC 2010 summer project week to help integrate SPECTRE as a Slicer3 extension. John Bogovic presented "Topology-Preserving STAPLE" at the IEEE Workshop on Mathematical Methods in Biomedical Image Analysis (MMBIA 2010), San Francisco, California, June 14, 2010. Min Chen presented several posters from the lab at the 16th Annual Meeting of the Organization for Human Brain Mapping (HBM 2010), Barcelona, Spain, June 6-10, 2010. Jerry Prince gave three 2-hour lectures at the IEEE EMBS International Summer School on Biomedical Imaging in Berder, France, 18-26 June 2010. This page was last modified on 16 April 2019, at 10:53.